We see it time and time again, the struggle brands face to stay current and top-of-mind. But to what extent can a brand change without upsetting the peace or losing valuable brand identity? In 1985, Pepsi was catching up to Coca-Cola in the legendary cola wars. Pepsi was growing momentum with its highly successful Pepsi Challenge. The concept was that if you were given two cups of cola (stripped of their branding), people would usually choose Pepsi over Coca-Cola for its sweeter taste. The whole campaign was encompassed around Pepsi’s repositioning strategy to appeal to the younger demographic. It was a risky move on Pepsi’s part to go after the youth market, but ultimately it paid off for them ten-fold, and created a clear differentiator between the two cola brands. 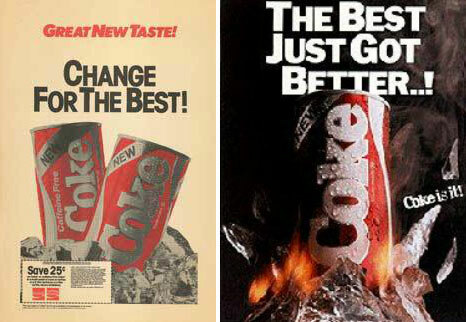 Coke, in a panic, did what seemed logical at the time – try to be more like their competitors. Coke began to do their own internal taste tests to change their taste to be more like Pepsi’s sweeter taste. After they settled on their new taste test-approved formula, they rebranded with “New Coke” in attempts to catch a “new” younger audience. Coca-Cola admitted defeat, listened to their loyal audience and returned the original Coca-Cola to the shelf. “New Coke” fizzled away. Peace was restored to the world, and a valuable lesson was learned. 2. They underestimated the power of their brand, which was originality. 1. Know what is beloved about your brand, and don’t mess with that. 2. Be different and be proud to be different. The moment you start copying the rivals, you lose.